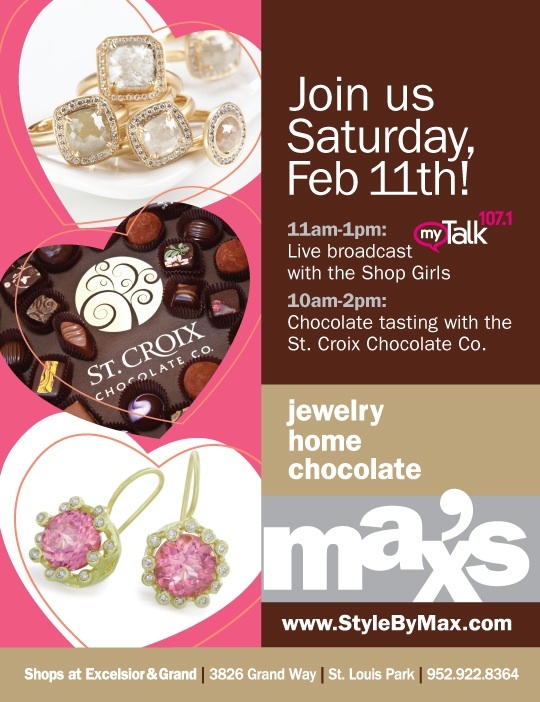 It's a Double Header This Saturday at Max's; A ShopGirls Live Broadcast and Chocolate Tasting! Posted on February 7, 2012 at 4:48 pm. It’s hard for me to believe, but last Saturday marked the 1 year anniversary in our new location! The year has flown by, and I’m thrilled that customer feedback is that you like this location more than the other location – so do I! So, to celebrate a little, I’ve invited the ShopGirls from myTalk107.1 back for another live broadcast from the store. We had so much time last fall when they stopped by, that it took me about one nanosecond to decide that this would be a really fun way to celebrate the occasion. In addition to the anniversary, what better time to invite Allison and Alexis ….and you……to the store than right before Valentine’s Day, as we host a chocolate tasting with the delicious confections from Minnesota-based St. Croix Chocolate Company. Of course, Valentine’s Day isn’t just about the chocolate – jewelry works well too, right? I hope that you’ll join us for the fun — and the treats! — the live broadcast will take place between 11-1 and the chocolate tasting is from 10-2. And, because VDay IS right around the corner, we’ll be open this Sunday from noon – 5.